Jack's has Briggs and Stratton Snow Blower Accessories, like electric starter kits and extension cords for your snow blower. Equip your snow blower with an electric starter for quicker and easier starting. If your snow blower already has an electric starter, use the extension cord to reach a convenient outlet. 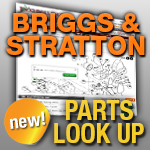 Select your Briggs and Stratton snow blower accessories below.